Over 80 delegates attended South Kesteven’s first Skills Summit on Wednesday 13 March. It was the first time InvestSK hosted such an event for businesses and education providers to discuss ways of growing the District’s talent to better serve the needs of local employers, both now and to identify and bridge any future skills gaps. Hosted at Belton Woods Hotel near Grantham, the event was attended by delegates from across South Kesteven and headlined by former MP, Neil Carmichael, who delivered an inspiring presentation to encourage businesses and education providers to work together to grow a workforce fit for a changing economy. 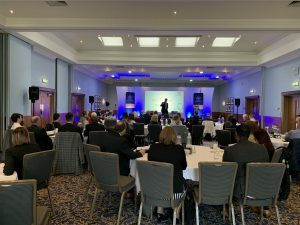 The event’s morning session welcomed speakers from the Greater Lincolnshire Local Enterprise Partnership, University of Lincoln, Will & Probate Services and Stamford and Grantham Colleges to share their training provider perspectives and a range of business success case studies from around the district. Interactive workshop sessions in the afternoon saw delegates discuss the benefits and barriers of hiring apprentices, how to achieve business growth through workplace training and what courses businesses want to see delivered at the new university centre which is due to open in Grantham this year. Steve Bowyer, chief executive of InvestSK, said: “South Kesteven has a bold ambition for economic growth – and to grow our economy we need the right skills in our workforce, to meet business needs now and in the future. “The only way we can achieve that is by engaging with local companies to understand their skills needs and then working with education providers to bridge any gaps. This is the start of that important conversation and I’m grateful to all delegates who attended and contributed today.